Non-invasive cosmetic procedures are at the forefront of the beauty industry. Gone are the days when the only way to make a significant change to your appearance was to go under the knife. There are now a number of effective procedures that can give you the look you want without the intensity of major surgery. Chief among these are dermal fillers. Through the use of hyaluronic acid, this procedure enhances facial features and adds volume to the face in order to reduce the effects of aging–all at a great price. Though dermal fillers are a great alternative to plastic surgery, there are a few things you should know when considering getting them for yourself. In this article, we’ll walk you through the top five things you should know before getting dermal fillers. Hyaluronic acid is the key ingredient in dermal fillers. This same substance is found in our natural skin, which makes it the most obvious choice for injections. 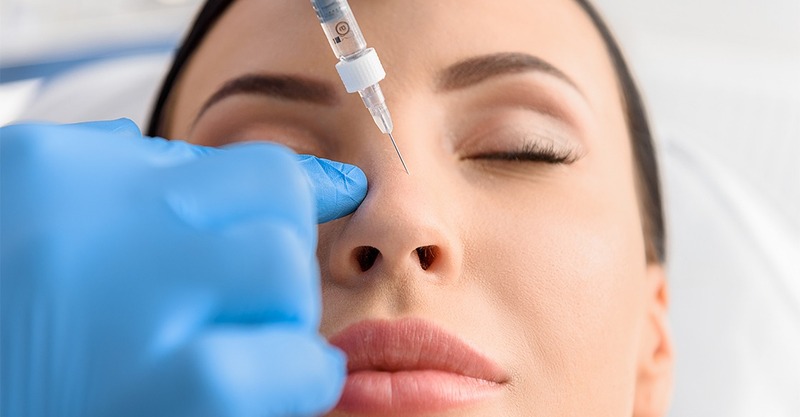 Botox injections work by freezing muscles to prevent lines and wrinkles from forming, but dermal fillers fill in those lines and smooth the skin without harming your muscles in the process. As we grow older, the plumpness and glow of our skin tends to diminish. This is due to the fact that the natural hyaluronic acid in our skin diminishes with age. By using hyaluronic acid dermal fillers, we can help our skin hold moisture, which gives plumpness and a youthful glow back to our skin in a natural way. It’s important to get fillers that are not obvious to the naked human eye. Medical developments have improved fillers to the point that the best ones are those that go undetected. They should enhance natural features, rather than drastically change them. It’s vital to find a practitioner that understands how to inject and place fillers in a way that makes them look more natural. If you’re considering getting a dermal filler injection, it’s important to do your research. Each practitioner has their own way of taking on the procedure, and that way might not coincide with your goals. Each practitioner’s method is based on his/her level of expertise, technique, and understanding of the desired results. Voice your opinions openly when you go in for a consultation and seek practitioners who listen to your goals. It’s also always a good idea to look through websites of practitioners you’re considering. Look for reviews and before and after pictures. These speak volumes about each practitioner’s method and can help you decide which method will work best for you. Though it may be tempting to go with a cosmetic treatment that’s on the cheaper side of the spectrum, it’s not always the safest route to take. An inexpensive filler is often diluted or counterfeit, which can mean it’s more harmful than helpful to your cosmetic goals. While rare, and completely unethical, some companies will cheat their customers with these fillers to increase their profit margins. Dermal filler treatments with genuine products usually start at around $650. It’s important to understand that dermal fillers are not for everyone or every circumstance. They are not suitable for those who are pregnant or breastfeeding. They are also not suitable for those who may be sick with a sinus infection, as the infection could spread to the injection site. If you are considering getting dermal fillers, it’s also important that you do not visit the dentist immediately after getting your injections. Often in dental treatment, your dentist has to stretch your face, which could displace the filler–leaving you with a less than desirable look. If you are considering getting dermal fillers, look no further than SDBotox. SDBotox offers a wide range of non-invasive cosmetic procedures, including dermal fillers. Book your dermal filler consultation today and help SDBotox help you reach any and every cosmetic goal you have in the safest, most effective way.